Do you know your Triceratops from Tyrannosaurus and Giganotosaurs? Well neither do we... until the day Dinosaurs landed in Singapore! When the invitation came to preview the Titans of the Past, we were in intrigued especially when we were told we will be seeing dinosaurs that move! 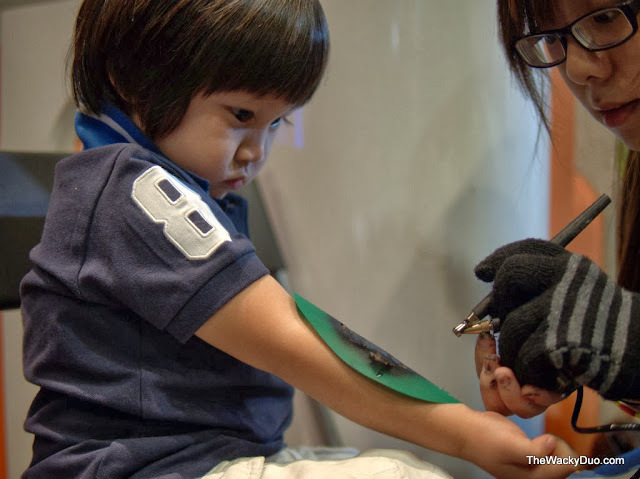 There are 2 exhibits on show at the 3000 square metres annex at the Science Center. Be prepared to be in awe of the Dinosaurs and Ice Age mammals. The show is on till 23 February 2014. When we met the blue dinosaur at the door that greeted us, we thought our legs were pulled. Yes it is real and it moves, but it is a cartoon character! For the moment we thought we were going to see a Barney Live Musical. It was only through the main door that we caught a glimpse of what is to come. A huge skull of a Triceratops greeted us at the entrance. Upon further in , we chance upon a life like Triceratop. Wth animatronics from Kokoro in Japan, the Dinosaurs were bought back to life in this exhibit. See the video on how a Triceptor protect her young ones . For a moment, we thought it was real and the dinosaurs had been bought back from the past. Next up, we chance upon family of Hypacrosaurus stebingeri. It is a rather difficult name to remember. Anyone knows why Dinosaurs have such long names? Our theory, is that they have to be long in order to sound ancient and grand... Exactly what a dinosaur is know for. 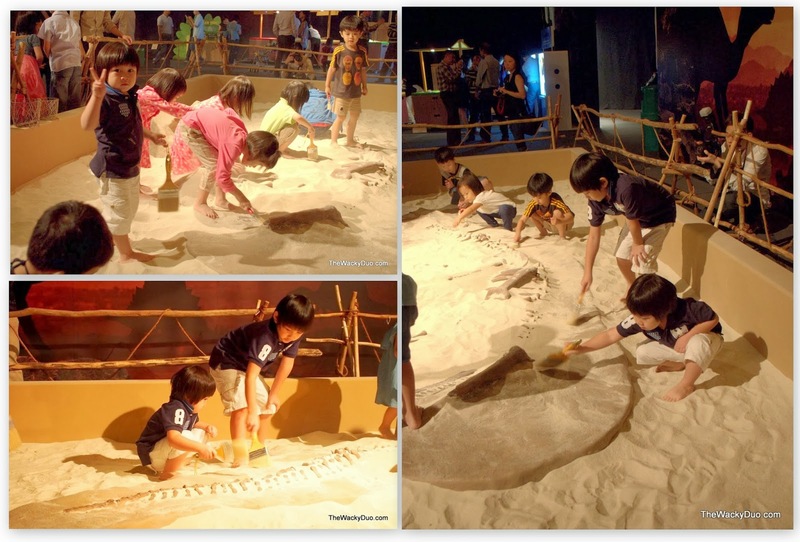 This exhibit is developed by world renowned paleontologist Dr Jack Horner. He is well known as being the technical adviser of Jurassic Park. The first film that probably feature realistic life like dinosaurs such as T-Rex on film. It is no surprise that the exhibit features the Tyrannosaurus or better known as the T-Rex. 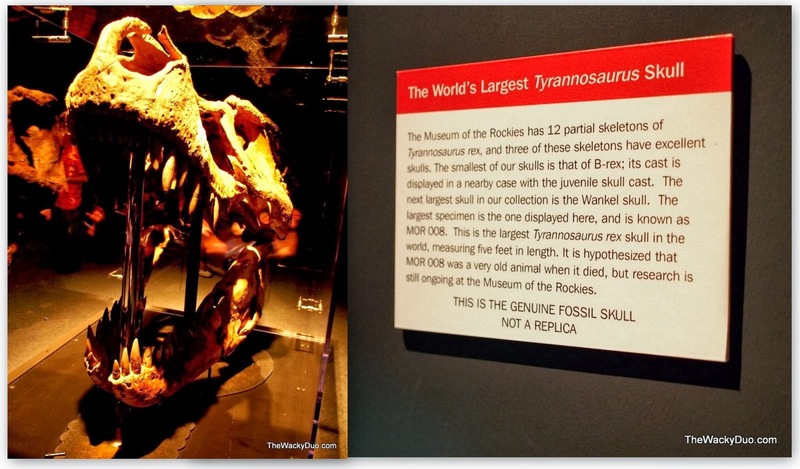 There is also a genuine fossil skull of the world's largest Tyrannosaurs on display. Yes, you are looking at the real deal. One of the Kings of the Dinosaur World in its heyday. There is also an animatronic T-Rex in the exhibit. Not all fossils on display are the real. There is a mixture of real and replica skulls, however the replica fossils on display are made of casts from the real ones. It would be as close to the real ones as you can get. Mid way through, we entered into the main hall and was greeted by 3 imposing dinosaur remains. The first was the Argentinosaur , the largest Sauropd ever found measuring a whopping 36 meters in length and 7 meters in height. This is about half the size of a Boeing 747! Next we met Gina and Stan locked in a battle of the Giganotosaurs, one of the largest terrestrial carnivores in the late Cretaceous period. Not all dinosaurs are being exhibit. Some are still in their boxes .... sleeping. The second part of the exhibit features 10 animatronics animals from the Ice Age. The animals of the ice age live in a different era from the dinosaurs. They are mostly smaller compared to the dinosaurs and resembled many modern animals . Nonetheless they are giants compared to their modern descendants and definitely not one you would want to reckon with in the wild. Walked into the chamber and you will be in awe with these moving mammals. It almost feel as if we were back in the Ice Age. There are 2 different ancient elephants on display. Can you tell the difference between a Mastodon and Mammoth? Some of the exhibit display includes the Sabre-toothed Cat, Glyptodonts and Pararctotherium. They resemble the Lion, Turtle and the Bear of modern days. There are more exhibits on display. We do not want to ruin the fun by showcasing them all. Do check them out at the Titans of the Past. We gave the exhibit a big plus on our scorecard for the numerous interactive stations that both intrigue and delight us. The highlight of the exhibition for us would be the gigantic sand pit located at the big hall. This is not a playground, but a digging site for future paleontologist. If we had our way, we would probably stay there the whole night to dig the bones out. Too bad the exhibit does not open for the whole night. After our archaeology adventure, we decided to explore the other interactive stations. And touch and learn stations, where we got our hands on ancient fossils. Big C even got interviewed for a TV commercial to be aired next month. There were some special media events for the evening. 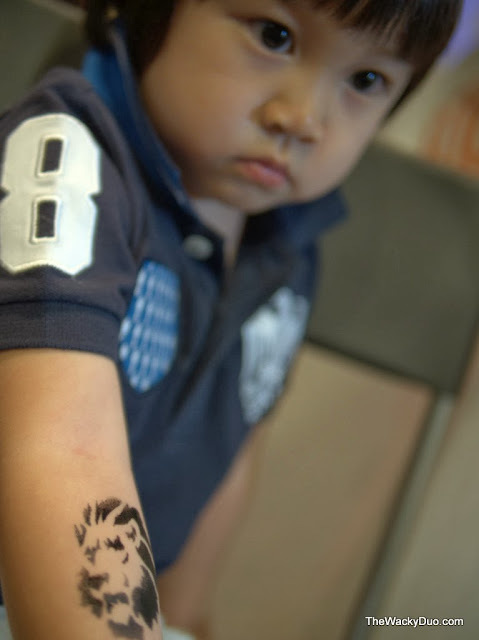 I managed to get a tattoo for the night. Thanks to Science center for the invite. It was an eye opener event and definitely an enjoyable evening spend with the Titans of the past. Be careful , the dinosaurs may bite!